David Cortez, Ph.D., and colleagues have now demonstrated that SMARCAL1, but not two highly related enzymes, responds to the replication stress at telomeres, caps that protect the ends of chromosomes and form unusual DNA structures. 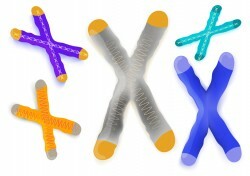 The investigators showed that SMARCAL1’s activity at telomeres could be separated from its genome maintenance function in bulk chromosomal replication. The study, reported in the Dec. 1 Proceedings of the National Academy of Sciences, identifies the first endogenous source of replication stress that requires SMARCAL1 and defines functional differences in replication fork repair enzymes. This new role for SMARCAL1 could contribute to the symptoms of Schimke immune-osseous dysplasia (SIOD), a human disease caused by SMARCAL1 mutations. This research was supported by grants from the National Institutes of Health (CA136933, CA160432).